I'm still not sure how it is that Obsidian Entertainment ended up doing a multiplayer armored combat simulator, but here it is: The Armored Warfare E3 trailer , a brief gameplay clip demonstrating how armored recon, main battle tanks and self-propelled artillery will work together on the battlefield. I was only half paying attention when I first watched this video and it took a moment to register that I wasn't looking at another chunk of World of Tanks gameplay, but rather the next big thing from Obsidian. The game was announced a few months ago, but it still seems strange that the developer of Knights of the Old Republic 2 , Fallout: New Vegas , South Park: The Stick of Truth , Pillars of Eternity —full-on RPGs, in other words—is doing a free-to-play tank sim. The trailer itself is fun—tanks blowing stuff up usually is—but has a very pre-release vibe to it, too. The vehicles look insubstantial and "floaty," and while it's hard to say for certain because of all the smoke and fire, they don't seem terribly destructible either, even when they take a direct artillery hit. 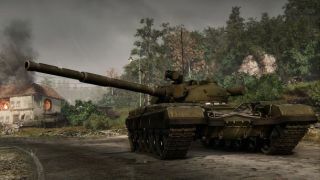 Applications for a closed beta are still being taken at aw.my.com and there's no launch date yet, meaning that there's plenty of time to turn it into a solid armored combat sim. But there's clearly still work to be done, and if you get into the beta you might be able to help.